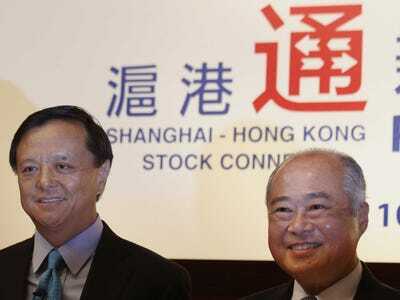 Hong Kong (AFP) – A delayed trading link between Hong Kong and Shanghai’s stock exchanges will start on November 17, the Hong Kong exchange announced Monday. The bourse connection — which is expected to allow the equivalent of $US3.8 billion a day in cross-border transactions — had originally been slated for last month, but was unexpectedly delayed as pro-democracy protesters continued to shut down sections of Hong Kong. The link-up is seen as a key step towards greater financial liberalisation in the world’s second largest economy. “The SFC and the CSRC jointly announced today that the launch of Shanghai-Hong Kong Stock Connect on 17 November 2014 (the ‘launch date’) has been approved,” said a statement issued by the Hong Kong Stock Exchange (HKEX) early Monday. The SFC is Hong Kong’s Securities and Futures Commission (SFC), and the CSRC is the China Securities Regulatory Commission. The joint scheme is expected to see volumes on both exchanges rise significantly, particularly Shanghai, but it is subject to strict limits in order to preserve capital controls in China, where Communist authorities keep a tight grip on the yuan currency.